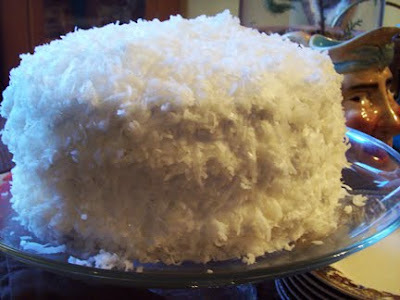 Tomorrow is my grandmother's birthday and one of her favorite cakes is a coconut cake. It was my great grandmother's specialty. So I spent the afternoon whipping up one, it wasn't easy but I think it turned out pretty good! • Whipped cream filling (recipe follows) I used Stonewall's Lemon Curd instead from the shop-makes it much more delicious!!! 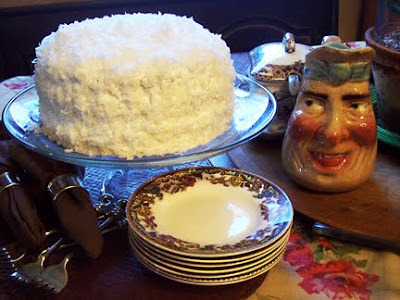 Coconut cake is such an essential part of the Southern culinary landscape that it was featured alongside fried chicken, greens and cornbread during a "state of the plate discussion" at the 10th annual Southern Foodways Alliance symposium. This cake would be fantastic to make for Easter.